Enjoy easy incredible body toning and therapeutic reflexology with this amazing Magnetic Reflexology exercise Twist Board. Harnessing the tremendous power of magnets this unique exercise disc help improve circulation as you twist your way to a tight toned slimmer physique. Utilizing the principles of reflexology magnetic fields aid circulation as multiple therapeutic massage nodules release tension from your feet while also helping with balance and traction. Use of the twistboard is great for toning hips and thighs as well as tightening abs and strengthening your core. 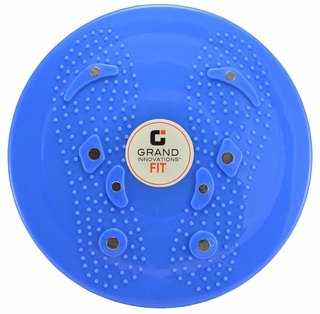 Ideal for all fitness levels.The diameter of the board is 9.5 inches.